Bill Flora is looking into the 7 CBs in the reader end of the machine that were apparently updated to photo disk CBs. 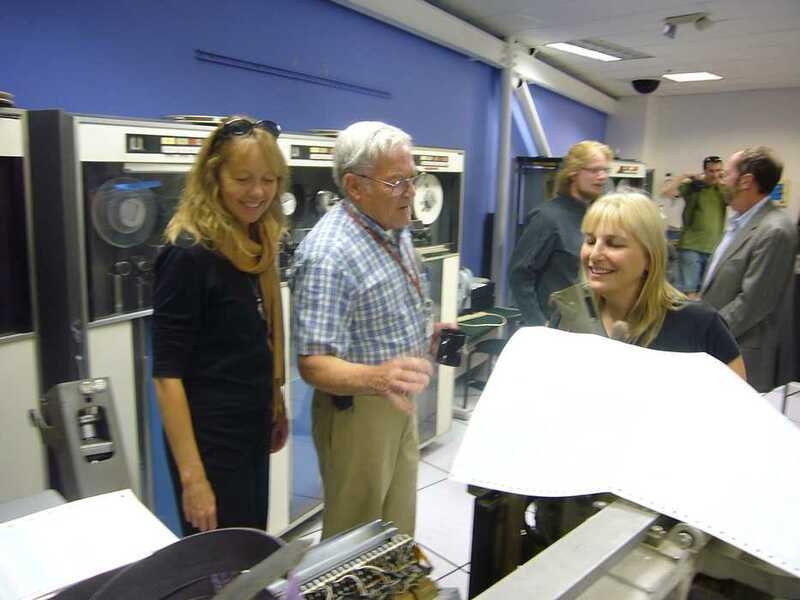 Bill, Ron and Judith made archival photocopies or the 31 and 32 pages of the CPU and the 1402 wiring diagrams. Stan is working on the new text for the Big Print program per Robert Garner and fixed the jamming problem in Keypunch #4. Frank continued work on the 1403. All the 1401-2-6 air filters were vacuumed. Joe continued working on the recalcitrant 026. I [Judith Haemmerle] was photocopying most of the time, so I didn't really get any pictures. I took a couple after most folks had gone home. Here's one of Frank and the printer that I took last week, and one that shows the workspace - you can always tell serious work is going on when the jar of "red jam" comes out. ;) I'll send a second email with some of the places Bob F. worked on. Active/core restoration team (incl remote folks like Van). 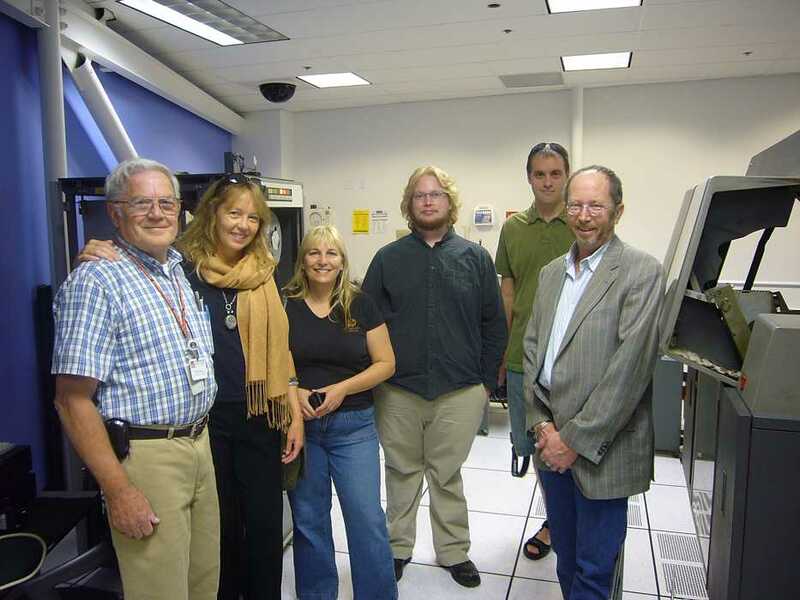 Emeritus - folks who have worked on the restoration project, but are no longer active. Steve [Russell] and I checked out the scopes in the 1401 room(s) today. We did a cursory checkout of the (4) channel TEK 2465 - and all the major functions we tested worked O.K. We will use it for debugging the PDP-1. We moved it to the PDP-1 demo room. We also "confiscated" the TEK 535 that was stored under the desk in the 1401 room. We will use it as an illustrative "period" piece of test gear. Another member of the Team volunteered to donate a "period" cart for the 535. 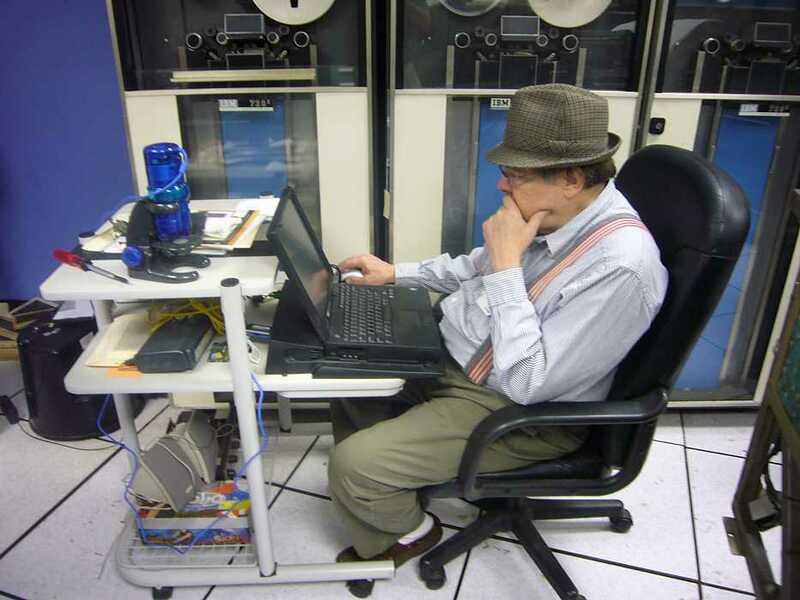 Thanks to Len for obtaining the TEK 2465 from SLAC and the 1401 Team for the TEK 535!!! Present were: Ron Williams, Bill Flora, Bob Feretich, Joe Preston, Stan Paddock, Judith Haemmerle, Robert Garner and Ed Thelen. Present were: Ron Williams, Bob Erickson, Bill Flora, Frank King, Joe Preston, Judith Haemmerle, Robert Garner and Ed Thelen. (2) Joe who finished one today. Bob Erickson reported that frequently a whole region of IBM would have only one expert of the 026 print mechanisms. Here are symptoms of our unreadiness to work - Bob Erickson wanted a picture of this backside of a regular coke can And Ron Williams wants to have this ALD (Automated Logic Diagram) blown up to wall size as a display And do Ron Williams and Bill Flora look organized? Well, OK, Frank King was in top form, introducing the 1401 systems to his daughter Carla, who is usually motorcycling in Russia, China, Greece, ... Carla brought: "Lyn Bishop - she's a very well known digital artist who combines digital and fine art. She heads up an annual project at SIGGRAF and gets the latest equipment like large-format printers from Epson, etc. lynbishop.com [and] Kip Inscore, Peter LaPierre, Jim Inscore." Here is Ed Thelen reading up on "Synchronous Hysterisis Motors" at his "workstation", complete with microscope, radio to listen to 1401 electrical noise, and 40 watt vacuum tube audio amplifier. Ron Williams (tongue in cheek???) is suggesting that we appoint a committee to nominate an action committee to look into making another debug podium and book case, such as used on the German 1401 (see picture) especially for debugging the Konnektuct (is that really how you spell it?) 1401. 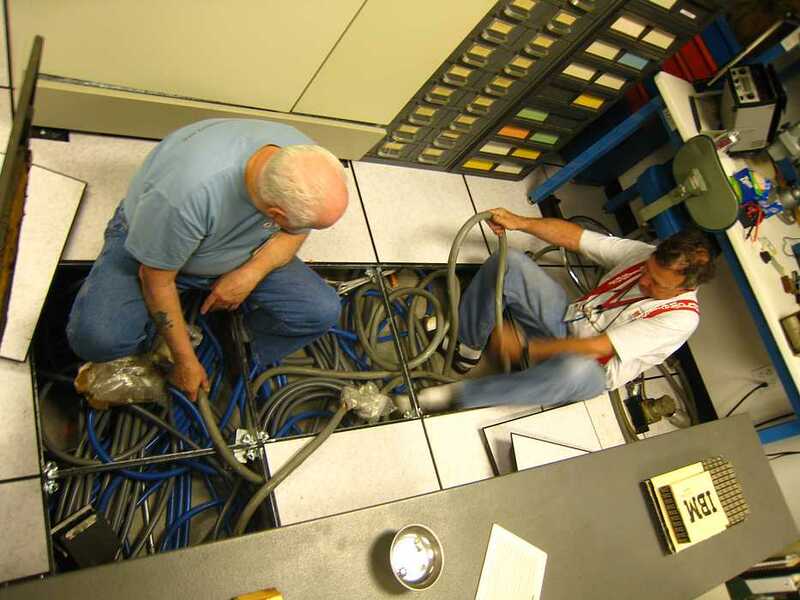 Judith Haemmerle helped Ed (all thumbs) Thelen remove the last two power supplies from the CT 1401. Another brass screw head broke off while untightening the wire lugs. Judith labeled the wires using tape and permanent marking pen. The second -12 volt 20 amp supply tested fine. The two -6 volt 12 amp power supplies acted as though they were "crowbaring" - placing a thyristor across the output causing a short circuit, forcing the circuit breaker to open - often used to prevent an over-voltage from damaging computer circuitry. To keep things from getting exciting, I placed a 60 incandescent lamp in series with the power supply - this also helps form any capacitors that un-formed during non-use. BUT there was no "Crowbar" card as in the German 1401 !! After much casting about for power supply diagrams - Judith mentioned that there were moldy diagrams in a box in invisible storage - waiting for an excuse to get photocopied to archival paper, and then to working paper. 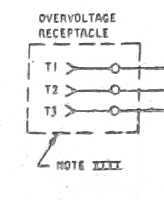 Here is the schematic of the power supply, conservative design for 1958. The incoming 133 volts is from a ferroresonant regulator, the rectified voltage on the three main filter capacitors is 12 volts - lots of "head room" for the linear pass transistors to output a regulated 6 volts. The red boxed areas, "detailed" below, refer to an "OverVoltage Receptacle" - which did not seem to be present! Mostly out of desperation, I "borrowed" a bank of adjustable load resistors from the PDP-1 group - no body was there to object ;-)) and set it for 1.4 ohms which was about 1/3 rated load. I connected it to the - 6 volt power supply - and it worked just fine. We had forgotten that pass transistors leak some, and at no-load, there was not enough resistance to drain the leakage, and over voltage occurred tripping the over-voltage circuit and thyristor - which we did not find !! Searching more seriously for some overvoltage and crowbar circuit, I noticed this little assembly buried in the power supply - it MUST be the optional crowbar circuit !! Oh yes, the electrician was in the 1401 room today, studying the three phase 60 amp connectors and electrical service box. The 5 vertical telephone jacks between 4) and 5) are for voltage "margining" to help weakening parts fail to function properly during testing, rather than in service. "Ron Williams had a question about this wiring bundle, which looks like an EC that wasn't fully implemented, or something along those lines. Do you know the history/story behind this loose bundle of wires that was stuffed in behind the front panel?" As per the photo with the yellow wires. This is pre Buzz's ownership. He thinks that Genesco had it wired to a tape reader or something along those lines. It never caused him any problems. Check the log books. 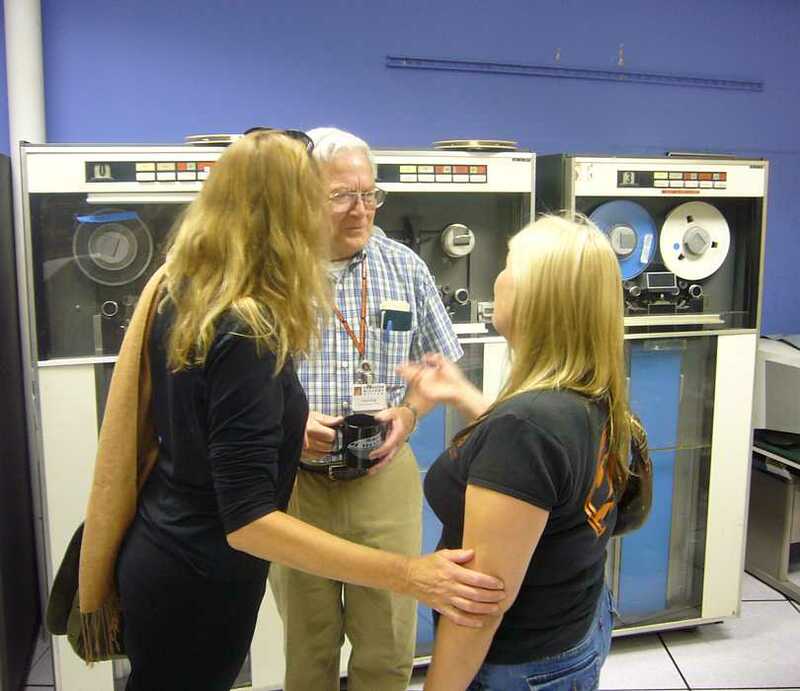 Buzz thinks that IBM disassembled the system when he bought it. Probably disconnected the wires at that time. Also the system was running good when he shut it down. Broken screw head. That's neat that you were able to find it. Power supplies are good. So when do you think blast off (power up) is going to be. I started working on some media ideas to promote Ct1401. If I have any interested parties, I'll give you and Ed a run down before doing anything. If the 1401 team has some ideas, I'm all ears. I'm also heading up to Ct over the 4th of July. The basement is finally dry. We are going to be getting things more organized. We will be keeping a close eye out for anything that might be needed for the project. Buzz did find this 1401 training manual/book. It's in good shape. It's little things like that, we'll hang onto and not throw away. One last thing. Per Buzz special request. Can we make up a bio for my brother Ray. He was involved, although on a small level. Just something simple, if its ok. My niece Kendra who is 7 yrs old, I'm sure do some kind of history project on Ct1401, one of these days. Say "hi" to the team on Wednesday. Early birds Bill Flora and Joe Preston listening to our speaker, Shel Jacobs, tell stories in the 1401 room. Dan McInnis came by. I wondered how to introduce Shel to a programmer, when Shel called out "Hi Dan" - they had know each other from somewhere in IBM :-)) Shel knew 3 or 4 in our restoration team!! Present in the Boole Room were: No - this is not a dismal financial report. We are concentrating on listening to Fran Underwood on the speaker-phone. Fran was the 1401's lead designer. Reminder that our next 1401 restoration all-hands meeting is next Weds, June 25th, 10 am - 1 pm, in the Boole conference room (upstairs). Please RSVP to me so I can give Jim an estimate head count for lunch. Introduction of lead designer "father of the 1401", Fran Underwood (on phone) and "1401 marketing lead" Shel Jacobs (in person). "Raiders of the Lost Basement" flick of our expedition to Buzz & Scott's house in CT to extract their 1401 system. Pictures from our visit to IBM Archives in Fishkill and Somers., including some of the many marketing 1401 pics. Discussion of DE and CT 1401 restoration status, plans for future, questions, etc. Playing of the Oct 5th, 1959 closed-circuit TV 1401 announcement. (1 hour, during lunch, if we make it thru it). Fran Underwood talked from his home in Texas. He has had several strokes and does not travel. His memory and speech is good. He spoke for about 20 minutes from prepared remarks, then responded to many questions from the audience about the reasons for many decisions in the 1401 system. Robert Garner video "taped" all of the meeting - Now, how to make a transcript of that fascinating thing. Shel Jacobs is a Great public speaker, he regaled and fascinated us with stories and facts such as that the 1401 was almost canceled 1 month before formal public announcement. He discussed why it was almost canceled, and how it was rescued. 5,500 systems were booked within 5 weeks after public announcement. When asked about whether the 1401 designation had to do with the 1400 characters of memory available, Shel said the name was purely arbitrary, but IBM was running out of 3 digit names - ... Says he has hours more of great 1401 stories. His contact info is in the bio page.